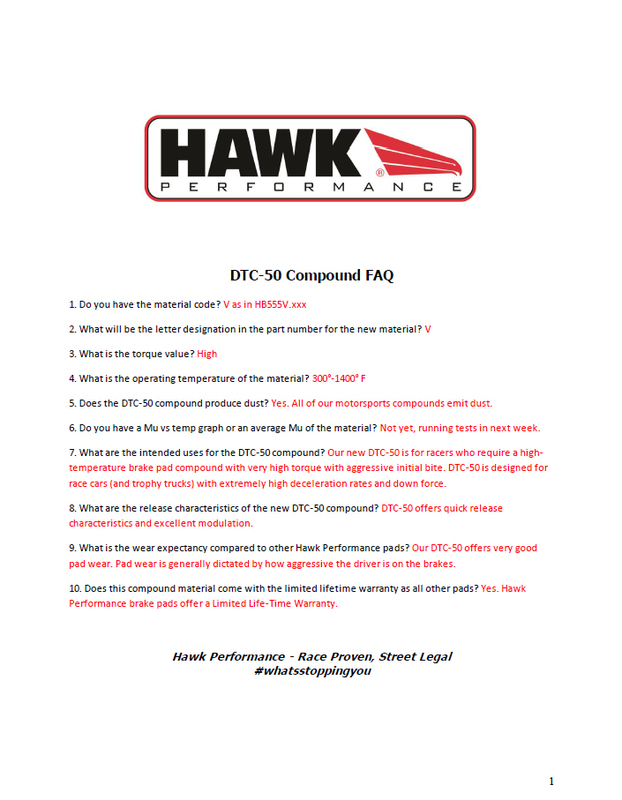 The Hawk DTC 50 is what our racers have been asking for, so we listened; a pad that could be used as a split compound for tuning, and an endurance compound that can be used at the highest levels of racing. DTC 50 also bridges the temperature and Mu range from our current DTC 30 to DTC 60 race pad offering. This new DTC 50 compound was developed through extensive testing to provide racers with a pad that enhances the line of Dynamic Torque Control/DTC from Hawk Performance. Through this testing many changes and tweaks were made in order to meet the companies goals and to fulfill the desires and demands of racers. The end result is a pad compound that has many race track applications as it provides exceptional characteristics and a pad that provides consistent performance across a wide range of temperatures up to 1400 degrees while providing very high torque and aggressive initial bite. All of our race teams agree that the DTC 50 has tremendous stopping power with an industry leading initial bite. It also has a very predictable Mu gain throughout the torque curve, providing the purest of drivers the most desirable pedal feel on the track. The Hawk DTC 50 is a race pad in its purest form, stopping the most aggressive and performance driven teams on the track today. Characteristics: Excellent modulation and release, high temperature fade resistance. Torque: Very high torque with aggressive initial bite. Ideal for professional sports car racing, club racing, vintage muscle cars, high horsepower off road and stadium/short course vehicles. Brake pads designed for cars with extremely high deceleration rate needs. Click Below for a FAQ Sheet.